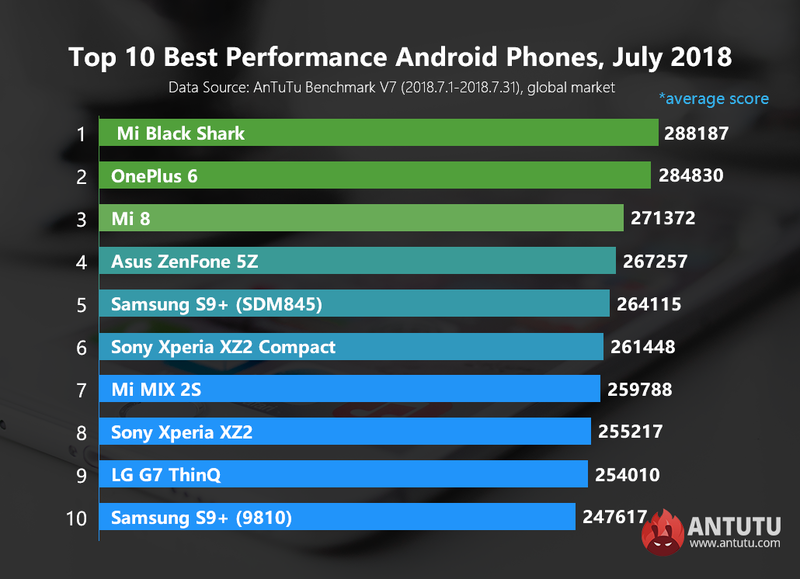 Today, it’s time for Antutu to reveal our benchmark results for Top 10 best performing Android phones for July 2018. There has been a subtle change in the ranking of July compared to last month. The Exynos 9810-powered Galaxy S9+ broke into the Top 10 again, overtaking the Snapdragon 845-powered Galaxy S9 to occupy the last spot. 2. Period of data statistics: July 1, 2018 to July 31, 2018. 3. Data amount: at least 1000 data samples per model. The top six best performing smartphones of this month remained the same compared to the ranking of last month. They are as follows: Xiaomi Black shark (average score 288,187), OnePlus 6 (average score 284,830), Xiaomi 8 (average score 271,372), Asus ZenFone 5Z (average score 267,257), Snapdragon 845 version of Galaxy S9+ (average score 264,115) and Sony Xperia XZ2 Compact（average score 261,448）. In particular, the single highest score of Xiaomi 8 reported to Antutu database has broken the 300,000 mark, of which the number is increasing. It should be noted that all these scores came from the developing models of Xiaomi 8. In the future when the stable version receives the new firmware update, the ranking of Xiaomi 8 is expected to increase. Xiaomi MIX 2S ranked 7th with an average score of 259788, followed by Xperia XZ2 and LG G7 ThinQ with an average score of 255,217 and 254,010 respectively. The Exynos 9810-powered Galaxy S9+ re-entered the Top 10, occupying the last spot with an average score of 247,617 one month after it fell out of the Top 10. With regard to other Snapdragon 845-powered devices, including OPPO Find X and vivo NEX flagship, since they are not yet available in the global market and their scores reported to Antutu database didn’t reach our statistical requirement, they are not included in this month’s Top 10 ranking list despite their high Antutu scores.